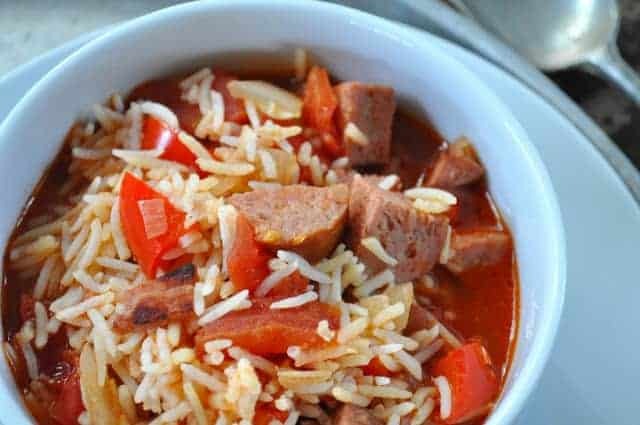 This one pot Smoked Sausage Jambalaya comes together so fast you’ll have to hustle to get everything else ready to go before it’s finishes cooking. Believe it! 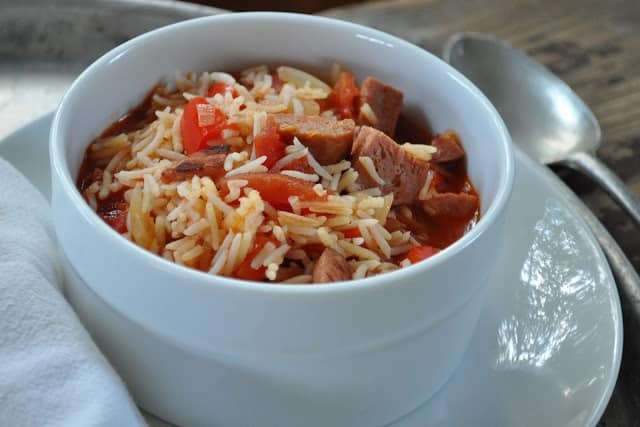 Smoked sausage and chopped ham are quickly browned with chopped onions and sweet peppers and then left to simmer in a bright tomato broth for just 10 quick minutes before you add leftover cooked rice to finish it off. Don’t have cooked rice? No worries, I have a few tips below to help with that too. 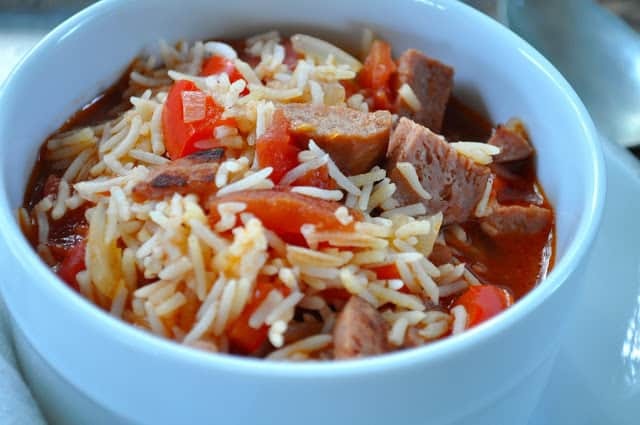 The secret to such a quick dinner is starting with leftover rice then you don’t have to worry about cooking it and/or sucking up all the broth while it to cooks. 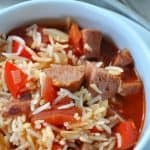 If you don’t have leftover rice you can start some long grain before you start this recipe and it will be done in time to drop in your jambalaya. You could in a pinch use instant rice it’s not as tasty as the recommend basmati but it will work. And if you’re thinking “meh too much trouble”, just remember to make extra rice next time you make rice and this recipe is all yours. 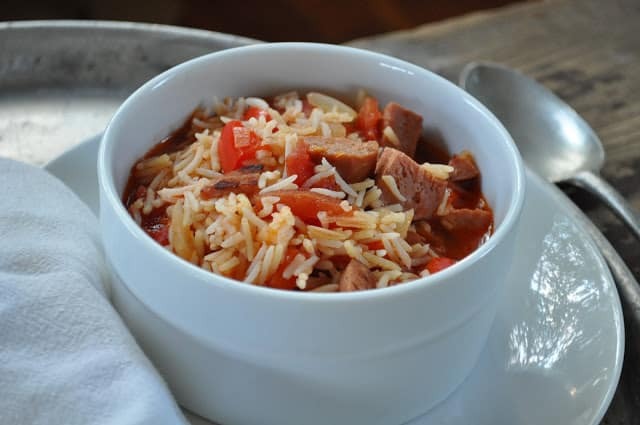 This recipe is endlessly open to variations–have more sausage and no ham, DO IT! Got chicken and no ham? Dice it up and use it. Only have ham? Try it! 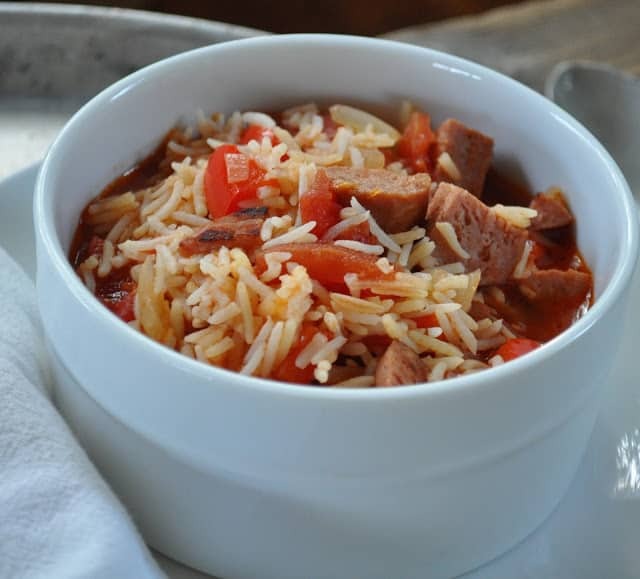 And you could even make it without the rice if you’re paleo!